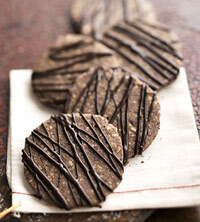 Day 10 of our 12 Days of Cookies features Chocolate Hazelnut Cookies, or sometimes called Cocoa Hazelnut Slices. A little chocolate during the holidays is a must. If you love chocolate and hazelnuts, these are the cookies for you! In a large bowl beat butter on medium to high speed for 30 seconds. Add sugar and salt. Beat until combined, scraping side of bowl occasionally. Beat in egg and cocoa powder until combined. Beat in as much of the flour as you can with the mixer. Using a wooden spoon, stir in any remaining flour and the hazelnuts. Divide dough in half. Shape each portion of dough into an 11-inch-long log. Wrap in plastic wrap or waxed paper. Chill for 1 to 2 hours or until firm enough to slice. Preheat oven to 375^. Cut logs into 1/4-inch thick slices. Place slices 1 inch apart on an ungreased cookie sheet. Bake for 6 to 8 minutes or just until tops are firm to the touch. Transfer cookies to a wire rack and let cool. In a small saucepan combine chocolate and shortening. Cook and stir over low heat until melted and smooth. Generously drizzle melted chocolate over cookies. Let stand until chocolate is set.